Bubbly since 1743, Moet & Chandon Imperial Brut Champagne is well structured, has complex fresh fruit and caramel flavours, sums up all the richness and finesse of the Moet vineyard. With irreproachable consistent taste and unique character, Moet & Chandon is indeed a highly treasured gift. 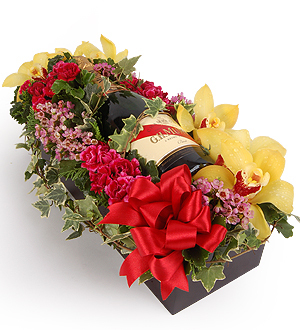 Arriving in a beautiful box with Cymbidium and sweet Roses, this is truly a gift to impress.